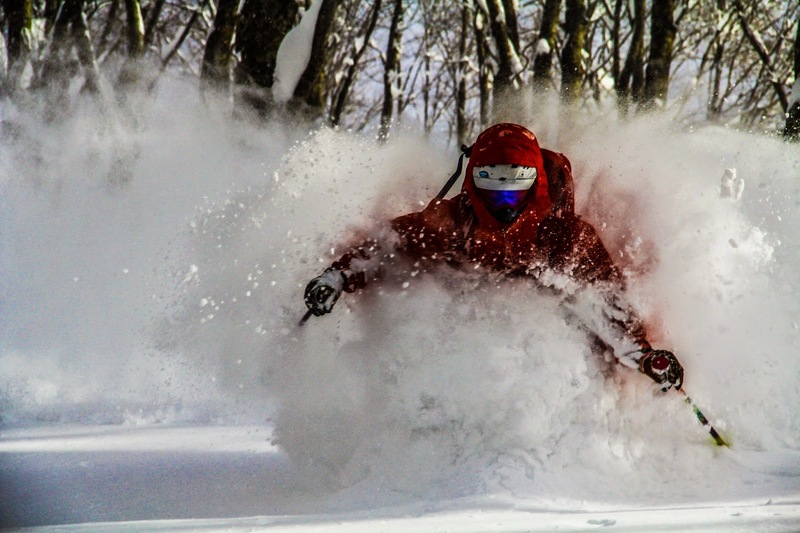 Skiers have a dream of floating through empty trees while huge snowflakes fall around us. It’s seemingly silent as the new snow drowns all sounds. Stopping to look up, individual flakes materialize and drift down from an infinite mass above. That dream was my image of Japan. With the sun barely 7 degrees above the horizon at noon, I wasn’t going to spend all of January in Alaska. The planning began back in July with an email to Miles Clark. The response: I’m in Indo surfing, getting over dengue fever, call me. Free refills on day one. Halfway around the world, the call to Miles would be from my desk. I minimized my work, dialed his number, and started taking notes. 15 minutes later, Miles finally paused: Any questions? Nope. The trip Miles’ outlined would have taken months to plan. Cody in the Cortina sidecountry. 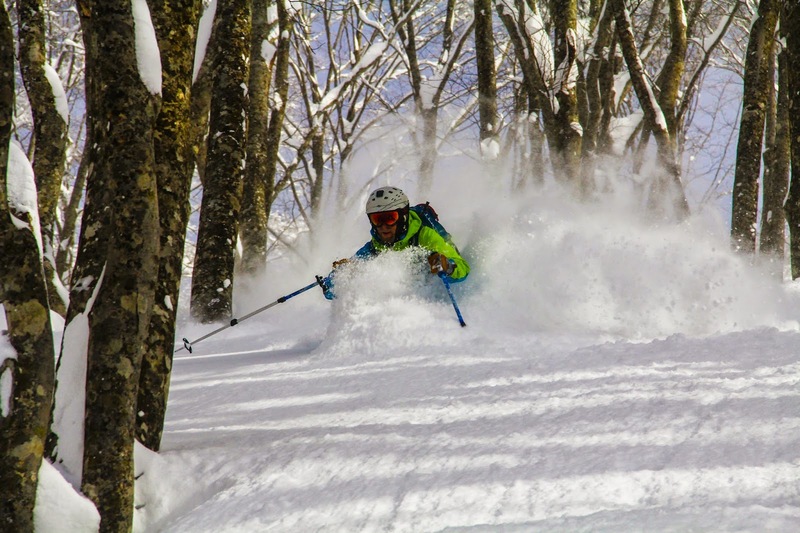 We’d fly into Tokyo, grab a bus to Hakuba, then make our way to the Hakuba Powder Lodge. Located at the same latitude as Fresno, January would be the time to go. Spread from the oil fields of the Arctic Ocean to the Front Range of Colorado, the team was on different work schedules and would each travel separately to Hakuba. Day 2, run 1. Photo: Cody Niggemyer. After an uncomfortable night in the Tokyo airport, punctuated by discovering that my skis had continued on to Singapore, I got off the bus in Hakuba. Heading into the backcountry as the storm cleared. When I staggered into the Powder Lodge, the crew was waiting on the couch. They'd been busy getting settled, collecting beta, and buying mysterious items from mysterious vending machines. 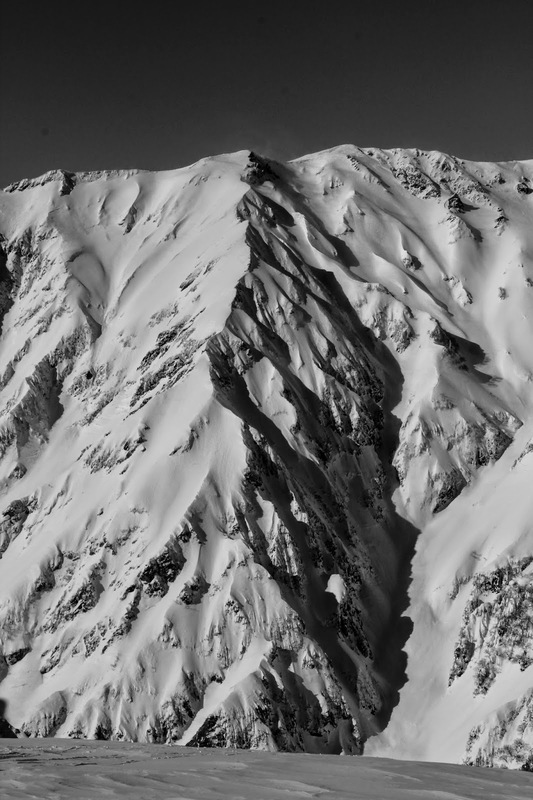 Johannes introducing us to the Norikura Ridge sidecountry. The next morning brought a promising forecast and new snowfall, so we skied across town to the train and headed for Cortina. Waiting at the ticket window seemed to take several lifetimes, but unloading the lift and skiing into the trees, all worries disappeared. With snow falling at 5 inches an hour, lift rides were spent wiping the new snow off, and runs spent piling it back on. I couldn't decide if the last run of the first day or the first run on the next day was deeper. After two stormy days spent plowing through the Cortina sidecountry, the storm passed and the mountains appeared. Getting to know the way around, and building an understanding of the snowpack, we explored further and further. 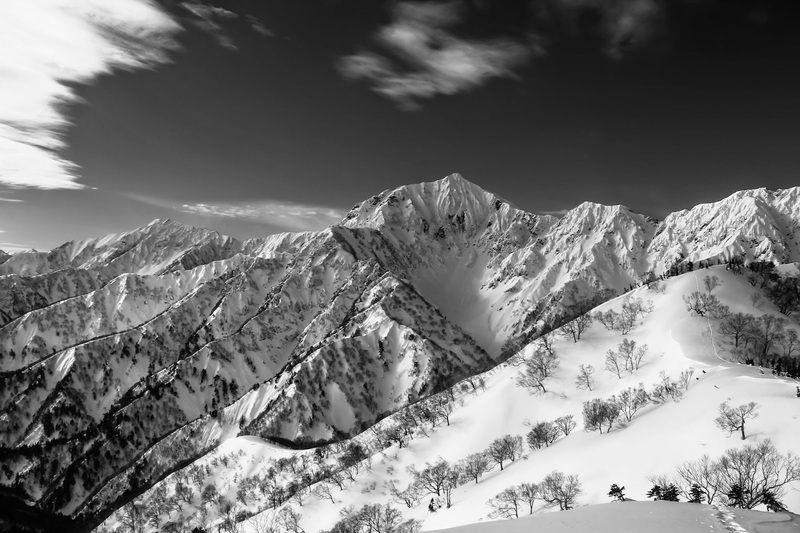 We spent two days riding the never ending ridges and spines of Goryu. After two days of stability and sun, the next storm moved in. Alex and I hiked up for one more lap above Goryu. Ripping skins and stuffing them in our backpacks, it was already deep again. Spring runoff is so severe in Hakuba that dams are built across the valleys to allow sediment to settle before reaching the municipal water intakes. After negotiating one such dam, we skied back home through town. 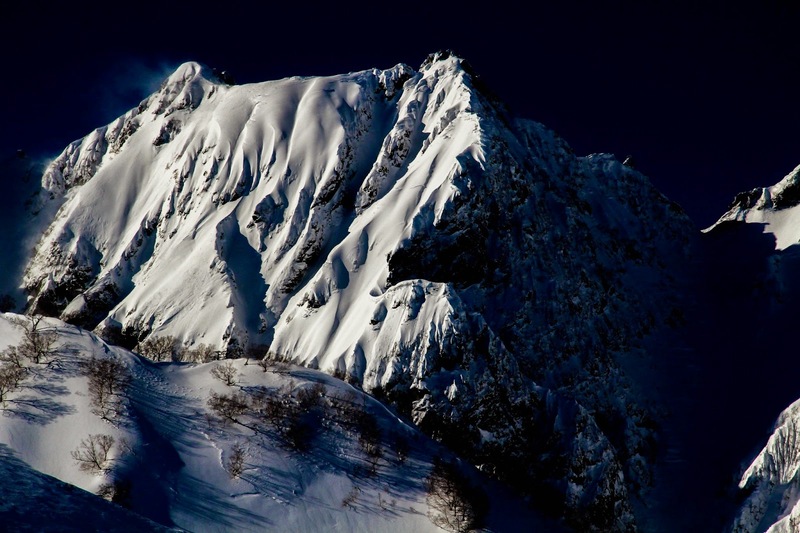 And work into the backcountry as confidence in the stability grew. Yep, just as deep as the chairlift snow-stake predicted. The lift didn't go where we wanted to. Fortunately, Cody and Alex found the midway unload station. High avy days were spent window shopping and making the to-do list for Japanuary 2016. Before I knew it we were standing on top of Norikura Ridge at 4 PM of our last day. Just like in the dream we floated through the perfectly spaced trees. But, one thing was different: it wasn't silent, instead it was filled with the laughter of four dear friends.